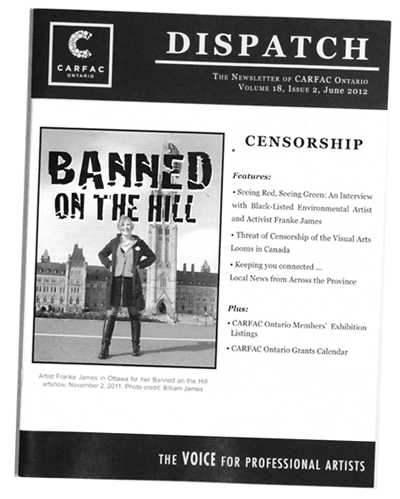 Franke James, a Toronto-based artist and outspoken advocate of environmental activism, speaks to Mariam Nader at CARFAC Ontario about her recent blacklisting by the Canadian government. In this interview, James elaborates on the final straw, the silver lining, and what she’s doing now. You can see all of James’ visual essays (including “Dear Prime Minister” and “Fat Cat Canada”, both of which were sources of contention for the Canadian government) on her website, www.frankejames.com. Is this the first time you’ve been censored? It’s not. 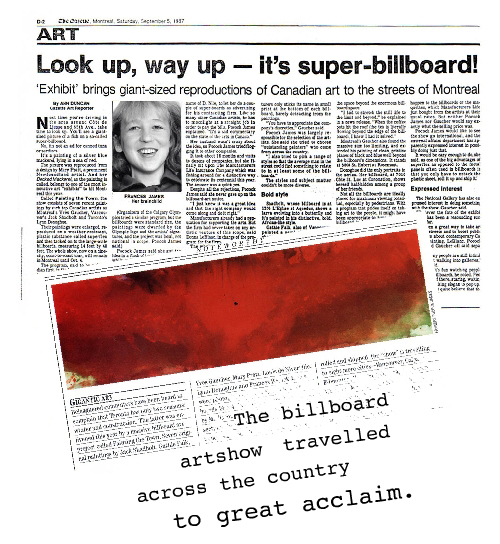 My first major showcase was a billboard exhibition titled “Painting the Town” in 1987, which was intended to be a showcase of Canadian art including works by Jack Shadbolt, Mary Pratt and Yves Gaucher, which would be displayed on 48 foot billboards. I included my own work in the show. 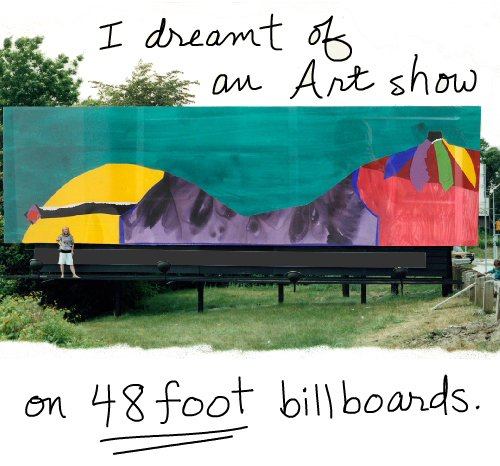 I worked for about nine months to find a sponsor—when I did eventually find one, they thought the idea of this billboard exhibition was fantastic, and they were fine with me showing my own work as well. But when it came time for my piece to go in, they thought it was inappropriate (it was a landscape that doubled as a female torso). The thing is, I think it was too provocative for them, and wasn’t in sync with their brand image. Which is a shame. But the fact is that I kept my mouth shut. I put in another piece, and it was basically a red orchid, but I saw it as red fury. I was absolutely furious. There was a silver lining, though; instead of this exhibition opening the door to a career as a gallery artist, it actually opened the door to a career in art, advertising and design. Which is good, because it gave me excellent experience in learning how to be a story-teller—I figured out how to combine words and pictures to communicate an idea. So when this whole issue came to light about your proposed European tour, you obviously weren’t going to hold your tongue again. Exactly. I just thought to myself, there is no way I’m going to keep my mouth shut. I’m going to make as big of a noise as I possibly can about this. Were you surprised by the reaction the Canadian government had to your European tour? I never thought about censorship in Canada as a pressing issue; it was only through this personal experience of mine in 2011 that I realized the gravity of the situation. So in terms of finding positive outcomes in this situation, it’s definitely allowed me to become hyper-aware of the need for free speech, and to realize that censorship can be a problem even in countries that we feel are democratic and open. My art show in Ottawa back in November was protesting the silencing of environmental voices, and since then, you can see how clearly the government is working behind the scenes to silence environmental voices. For example, the most recent budget (Bill C-38) is about 425 pages, but 150 of it have to do with re-writing environmental rules. They’re barring environmental groups from speaking out at hearings unless they live or work in the area, or have unique scientific expertise. Is this is a method of restriction? Perhaps one way of managing to get away with less people speaking out? These groups are advocates. Imagine that something unpleasant is happening in your backyard, and you’re only able to get help from your neighbors or the people who work immediately around you – you don’t have much strength in those few numbers, in comparison to being able to bring in these expert voices from across the country. From a strategic point of view of fighting a battle, these restrictions make a person much weaker. What is the government afraid of? They’re afraid of dissenting opinions; they’re afraid of pressure being brought to bear on environmental issues. 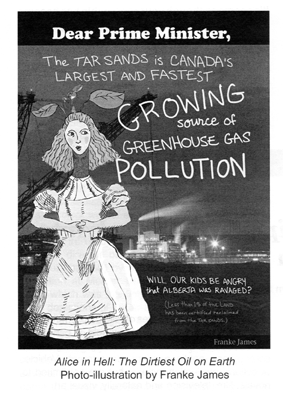 Canada used to be a leader in environmentalism. We helped to solve the problem of the hole in the ozone layer. But since Harper was elected, we’ve been going in the opposite direction. Everything is being done to benefit the oil industry. Basically, the censorship that I have suffered is a result of the bigger picture of the government fighting the labeling of the tarsands oil of being ‘dirty’. It’s part of a much larger campaign, and I’m just collateral damage. When you see other artists doing something provocative, do you ever think, “well, why me?” or are you happy to see other artists getting away with it? It’s like something out of a movie. That’s right. And all of this was happening in secret. I was never supposed to hear that the government didn’t like my work. If I hadn’t heard, I would have never taken the investigative trail of filing the ATIP. The interesting thing is, I’ve posted 165 pages of the ATIP documents, but since November, I’ve received 1,557 pages. And there’s more to come. You showed us excerpts of these emails in your visual essay. What could they be saying that requires so many pages to explain? A lot of it is repetitive, but basically we’re seeing these conversations between the Canadian Embassy and the bureaucrats in Ottawa about my artwork. And for example, there’s one email from the Trade Commissioner at the Canadian Embassy in Berlin, which was one of the stops on my European tour. His name is Thomas Marr, and he wrote to Vlatka Ljubenko (the cultural officer who was in the coffee shop in Crotia) an email with this subject line: “Franke James is your fault”. I couldn’t believe it. There’s very little I can read in that e-mail because it’s all been blacked out, it’s all been redacted. And the key parts we can see show that he’s criticizing me for my essays on the tar sands and forestry. But he didn’t do his research very well, because my essay “Who Cares about the Forest?” is about the Forest Stewardship Council of Canada (FSCC) and about the good things that are happening in the forest industry. So what was the reaction to your posters going up around Ottawa? They were right around the corner from the parliament buildings. I was thrilled, because I put out a release, and a lot of people showed up, including the media. Sun Media came out to interview me. Brian Lilley (from Sun Media) was great, he promised me that he wouldn’t edit what I said, and he didn’t. He put up the whole interview. No official statements from the government were released, but I can see some of the stuff behind the scenes because I applied for the ATIP after that. They were aware of the show, and they were monitoring the media, sending around links. It’s tricky, because they’re not actually saying much because they don’t want to put it into writing. They’re just saying, “Did you see this?” Or one funny one was, “You enjoy art. Why don’t you take a look at this show?” [Laughs] I would love to be able to see all those pages without redactions. I wanted to ask you about those. Under what circumstances can they block out text like that? Some of them are for personal privacy, which is understandable. A lot of the emails were redacted because of their nature pertaining to issues of “international security” and “the defense of Canada,” which is, I think, actually about international trade, and the government not wanting the tar sands labeled as “dirty oil.” Also, if a bureaucrat has a conversation with any minister, they are allowed to redact that. Like I said, it would be great to see what’s beneath those redactions because they’re making statements like, “I would not support Franke James’ show because…” and then it’s all blacked out! Tell me a bit about what you’re doing lately. I’m in a show at the Elora Centre for the Arts, entitled “Perspectives on Canadian Tar Sands and the Northern Gateway Pipeline”, which includes artists Ufuk Gueray. Verne Harrison and Reel Youth. [The exhibition continues until July 8th.] I’m showing my “Banned on the Hill” video and one of my canvases, plus a new visual essay [What is Harper afraid of?] 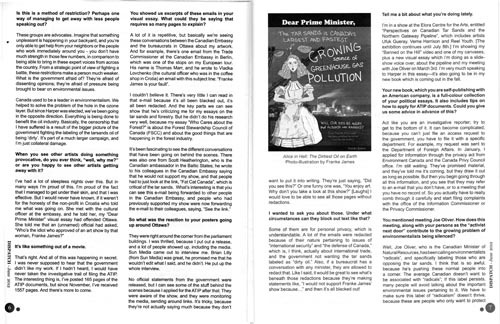 which I’m doing as a slide-show voice over, about the pipeline and my meeting with Joe Oliver on March 3rd. I’m very much speaking to Harper in this essay—it’s also going to be in my new book which is coming out in the fall. Your new book, which you are self-publishing with an American company, is a full-colour collection of your political essays. It also includes tips on how to apply for ATIP documents. Could you give us some advice in advance of this? Act like you are an investigative reporter; try to get to the bottom of it. It can become complicated, because you can’t just file an access request to the government, you have to file it with a specific department. For example, my request was sent to the Department of Foreign Affairs. In January, I applied for information through the privacy act from Environment Canada and the Canada Privy Council office. I’m still waiting. They’ve promised material, and they’ve told me it’s coming, but they draw it out as long as possible. But then you begin going through all this information, and you see that they may refer to an e-mail that you don’t have, or to a meeting that you have no record of. So you actually have to really comb through it carefully and start filing complaints with the office of the Information Commissioner or the Privacy Commissioner. You mentioned meeting Joe Oliver. How does this meeting, along with your persona as the “activist next door” contribute to the growing problem of environmentalists being silenced? Well, Joe Oliver, who is the Canadian Minister of Natural Resources, has been calling environmentalists “radicals”, and specifically labeling those who are opposing the tar sands. I think that is so awful, because he’s pushing these normal people into a corner. The average Canadian doesn’t want to be associated with “radicals”; If this label persists, many people will avoid talking about the important environmental issues pertaining to it. We have to make sure this label of “radicalism” doesn’t thrive, because these are people who only want to protect our right to clean air and clean water. We’ve got to stay in the mainstream if we don’t want to be labeled as irrelevant. I’m very much like your neighbor. My story-telling is about personal actions in real life. I talk about my family and my neighbors and the people I meet, and my future grandchildren. It’s ordinary and people can relate. It’s seems as though your censorship has become the subject of your art. Do you feel like you have a fire beneath you? Please check this out and share it with everyone you can.